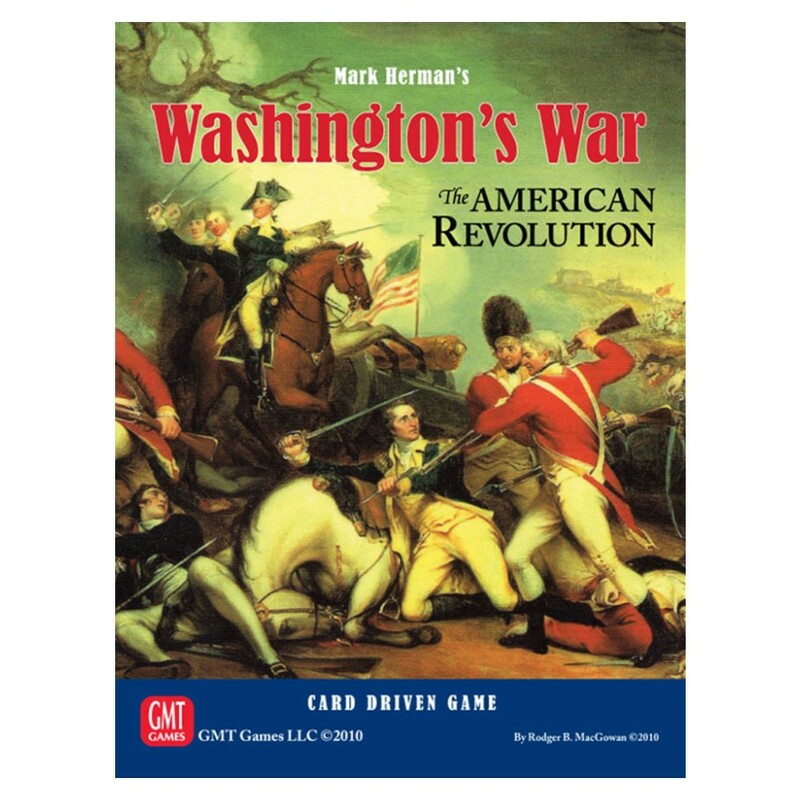 Washington's War is the long awaited re-design of the original card driven game, We the People. Washington's War, like it's predecessor, pits the forces of a world power (England) against its rebellious American colonists as they fight for their independence. Washington's War is a true re-design that maintains the deep strategy ofWe the People while creating a game with a very short playing time (approximately 90 minutes). Unlike most wargames, Washington's War allows you and your opponent to play twice while switching sides in one sitting. This feature allows for rapid tournament play either face-to-face or on the Internet. Washington's War is the perfect antidote for a time conscious crowd whose only option up to now have been Eurogames. Washington's War features a dice-driven combat system that quickly resolves combat and is very friendly to Internet play. The game also features a new CDG discard mechanic that makes every card in your hand playable by allowing your opponent to buy his discarded events for an operations card. Now, unusual card distributions create challenges adn not insurmountable barriers for advancing your strategy. The biggest design changes between We the People and Washington's War, besides the aforementioned new game mechanics, is the increased emphasis on the asymmetrical capabilities of the two sides. The British are a conventional army with a dominant naval capability that gives them great strengths in the coastal regions. The Americans are an unconvential force with a small Contintental Army led by George Washington who yearn for French intervention. While the British struggle to expand their influence inland, the Americans struggle to keep their militia forces in the field. In th end it is the side that is better able to play to their strengths and protect their vulnerabilities that prevails in Washington's War. Washington's War was broadly tested on the Internet in a tournament format to ensure clarity of rules under the stresses of competition. What was old is new again...be the man on the white horse and father a new nation, or be a king trying to save his empire during a world war.